A black-and-white photograph of President John F. Kennedy hangs on the wall of Nick Melvoin’s small office, which is the nerve center of his campaign headquarters in Venice’s trendy tech neighborhood. Kennedy’s on the phone, one hand covering part of his pained face. Melvoin, 31, often looks up from his folding-table desk at the iconic photo when he’s making fundraising phone calls — definitely not his favorite part of campaigning. With less than nine weeks remaining before a May 16 runoff when Melvoin will attempt to unseat two-term incumbent and board President Steve Zimmer for the LA Unified school board District 4 seat, those phone calls are multiplying. Melvoin wants to raise as much money as he did in the primary — nearly $425,000 — the most of any school board candidate since individual contribution limits were put in place a decade ago. It will likely be a significant challenge considering he had a year to fundraise ahead of the primary, and city campaign fundraising rules dictate that he has to start at zero. The first-time candidate will also have to juggle making those phone calls and meeting voters face to face, something Melvoin will lean more heavily on in the runoff. That’s vital, he said, because he needs to dispel the misinformation that he is a “Trump guy.” He’s convinced that will turn some Zimmer voters his way. “I think there will be some cracks in the ranks,” he said. Mailers funded by United Teachers Los Angeles’ independent expenditure committee that said he supported for-profit charter schools and attempted to align him with President Donald Trump and U.S. Secretary of Education Betsy DeVos. He opposes all three. Melvoin will tell voters he is a lifelong Democrat, worked on Hillary Clinton’s campaign last year and as a law school student worked in the White House during the Obama administration. “It’s actually easy to flip people because then the rest of our platform resonates,” Melvoin said. 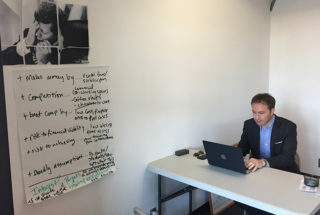 The only sign of Trump in Melvoin’s campaign office is a sarcastic reference to the president’s Palm Beach, Fla., resort Mar-a-Lago, the name the campaign has adopted for the closet-sized room with a futon where campaign volunteers make phone calls to voters. In an interview on election night, Melvoin said he had hoped that the tone of the campaign would become more positive in the runoff, but after hearing Zimmer’s election night comments, Melvoin believes that is unlikely. Melvoin wants to shift the narrative of the campaign in the runoff to “change versus more of the same,” as described in a letter from Melvoin’s campaign consultant, former Obama spokesman Bill Burton. “One of my hesitations in running early on was my respect for Steve as an educator, as a public servant. I never knew him too well, just as a person, but ultimately it came down to it’s been eight years and this is a long term,” Melvoin said. The term is five and a half years to align city elections with the state and federal election schedule. Melvoin was one of three challenging Zimmer, who is seeking his third and final term. Zimmer fell short of avoiding a runoff by about 3,135 votes, according to the latest primary results. The results are expected to be certified next week. Zimmer received 47 percent of the votes counted so far, while Melvoin received 33 percent, Melvoin said both figures were roughly what he expected. Allison Holdorff Polhill, who endorsed Melvoin the day after the election and pledged to vigorously support him, received 14 percent of the votes. Gregory Martayan received 6 percent. Martayan has not announced who he will endorse yet and is meeting with both Zimmer and Melvoin before he makes his decision. Many of the mailers, TV commercials and other ads surrounding the campaign were orchestrated by outside groups — from the teachers unions on one side and charter school supporters and education reformers on the other. The reformers see the District 4 seat, which encompasses the west side of LA, Hollywood, and portions of the west San Fernando Valley, as crucial in shifting the ideological balance of the board toward a reform majority. The two sides poured $5.4 million into the campaign. Zimmer was supported by UTLA and other labor groups, while the reformers back Melvoin. Many observers believe outside groups will continue to pour cash into the runoff. Less than two weeks past the primary, outside groups have not reported spending any significant amount of money. Melvoin used to be a full-time LAUSD teacher. He, like Zimmer, started teaching through Teach for America. Melvoin worked at Markham Middle School in Watts until he was laid off during the Recession, while Zimmer started his career at Jefferson High School in South LA and then was placed at Marshall High School in Los Feliz. After he was laid off, Melvoin earned his law degree. He worked on the ACLU’s Reed v. California lawsuit, which challenged LA Unified’s seniority-based teacher layoff policies. He is a substitute teacher for LA Unified. Melvoin said rather than working for the ACLU or other organizations to sue the district, he decided to run for a seat on the board so he could work to shape better policies. He said was not surprised by UTLA’s attempts to align him with Trump and DeVos. “It’s something we anticipated as soon as it all was unfolding,” he said. “To me, it’s really about the future of LAUSD, the opportunities that are here, the innovation that’s possible in a city like LA,” Melvoin said. “I think the stars can align when it comes to things like Marshall running,” referring to Marshall Tuck’s entrance into the 2018 race for state superintendent. Some innovative ideas that Melvoin has for the district include giving traditional schools some charter-like autonomies such as more control over budgeting and creating an “ed-tech incubator” inside the district’s Beaudry Avenue headquarters, partnering with tech companies like Google, Snapchat and SpaceX where students and teachers could have fellowships to come up with technologies that would benefit the district. One idea Melvoin has is an LAUSD mobile app to provide information to students, parents, and teachers rather than relying on robo calls. Melvoin also said he supports a universal enrollment system that will include charter schools. As a board member, he would work with charter leaders and parents to help them find private space in the city. He talks about mitigated charter growth and that he would work with charter school operators to open charter schools where they are needed rather than areas that are over-saturated. He believes the state should reform its tenure and last-in-first-out laws that were challenged as part of Vergara v. California. And he believes the district should pay new teachers more earlier in their careers — for example, giving teachers financial incentives to teach at low-performing schools. He also wants to create a parent concierge position so someone would be able to answer questions for parents, rather than parents having to search for information themselves. One thing that Melvoin said he wants to talk more about in the runoff is how if he is elected, he will champion a parcel tax to fund arts and special education programs for the district. That’s where his ideas to make the district’s budget more transparent — like by posting detailed information about each school’s budget online — come into play, he said. He said promoting a parcel tax is an area where charter school supporters and the teachers union could work together. The last time the district put a parcel tax on the ballot — in 2010 — 53 percent of voters voted for it, short of the two-thirds approval required to pass. In 2012, the board had planned to put a parcel tax on the ballot but withdrew it because it would have competed with state propositions for K-12 funding also on the ballot. While Melvoin credits Zimmer for having a focus on students who are living in poverty, he criticized him for not working with some west side parents, who felt abandoned by Zimmer as their charter schools sought classrooms.